A flooded filling station is seen in Binh Dinh, located in south-central Vietnam, on December 16, 2016. Mother Nature has not been so nice to Binh Dinh in the last two months of this year, having wreaked havoc on the south-central Vietnamese province with a series of floods. Binh Dinh has suffered four straight severe flooding events in the first half of December alone, plus another in early November. The latest flood hit Binh Dinh early this week and is on track to become the most severe flood in the province’s history, local authorities said Friday. “The water level has reached the record set in 2013 but it does not seem to stop rising,” provincial deputy chairman Tran Chau told Tuoi Tre (Youth) newspaper on the phone. On Friday, local military force and authorities rushed to rescue people trapped in their own houses as the surrounding areas were all flooded, with water level as high as their house roofs. Traffic was disrupted in numerous streets, while local residents started to suffering from lack of clean water, food and other necessities. “We did try to stockpile necessities in case of flood, but who could save enough food when the flood went on for half a month?” a local resident lamented. In a two-week period ending Friday, flooding, caused by heavy rains, has killed 25 people and injured ten others in Binh Dinh, according to the province’s steering board for disaster prevention, search and rescue. The natural disaster also inundated more than 57,400 houses, leaving 348 others collapsed, and 398 unroofed. The floods washed away some 3,180 livestock and 195,500 poultry, while destroying some 13,500ha of rice and 3,500ha of other crops, total damage estimated at more than VND1.23 trillion (US$54 million). On Friday, Deputy Prime Minister Trinh Dinh Dung directly came to Binh Dinh to inspecting flood response there. The deputy premier first offered sympathies to flood victims and asked Binh Dinh’s authorities to mobilize all resources and have plans ready to timely deal with any situation, according to the Vietnam News Agency. He stressed that local officials should visit and give encouragement to flood victims and prepare to help local residents resume their daily routines after the flood is over. Flooding has also been also taking a toll on other provinces along Vietnam’s central coast. In Thua Thien-Hue Province, preliminary data show that torrential rains and flood have claimed three lives and inundated 8,181 houses in the low-lying districts, forcing schools province-wide to close on Friday, the Vietnam News Agency reported. Asides from downpours, the water release by hydro power reservoirs in full spate has also caused flooding in downstream areas. 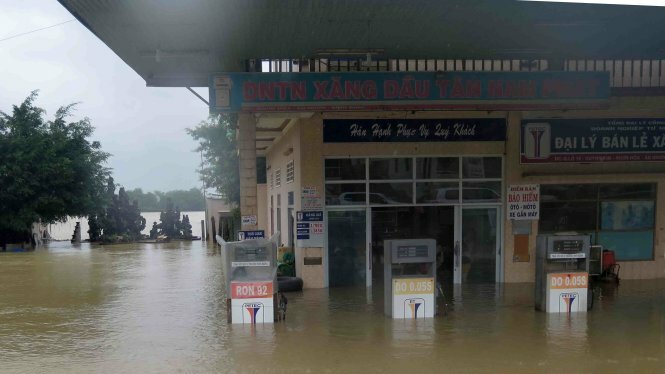 In Quang Ngai Province, widespread flooding was recorded in Nghia Hanh, Mo Duc, Duc Pho and Tu Nghia districts and Quang Ngai city on Friday, leaving thousands of houses under water. One people died and one other was injured in flood while about 24 ha of rice and 370 ha of other crops were damaged, according to the Vietnam News Agency. Many roads were deluged or eroded, isolating some localities, according to the province’s steering board for disaster prevention, search and rescue. Heavy rains are forecast to continue in the central region in the next few days, according to the Vietnam News Agency. In wake of these consequences, the government on Friday requested ministries, agencies and administrations of central provinces to work harder to deal with the widespread flooding which has left heavy consequences in the central region..